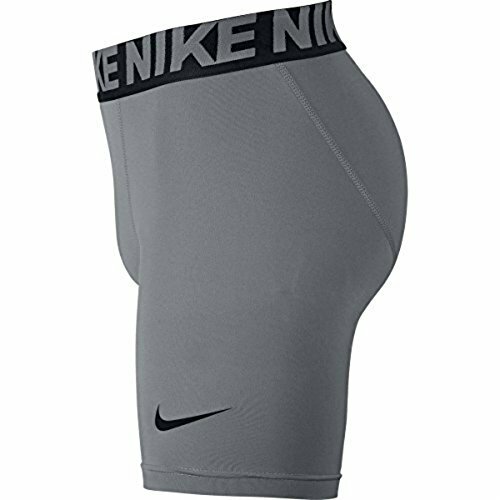 He can practice or play in comfort with the Nike Boys' Pro Cool Compression Short, which is made of 90% polyester and 10% Nike Pro Cool fabric for cool wear. Dri-FIT fabric technology wicks away sweat, while stretchy mesh panels provide ventilation and allow for easy mobility. An elastic waistband ensures a snug fit. Dri-FIT fabric technology wicks away sweat. Made of 90% polyester and 10% spandex Nike Pro Cool fabric. Stretchy mesh side panels provide ventilation. Large Swoosh design trademark on the left side.